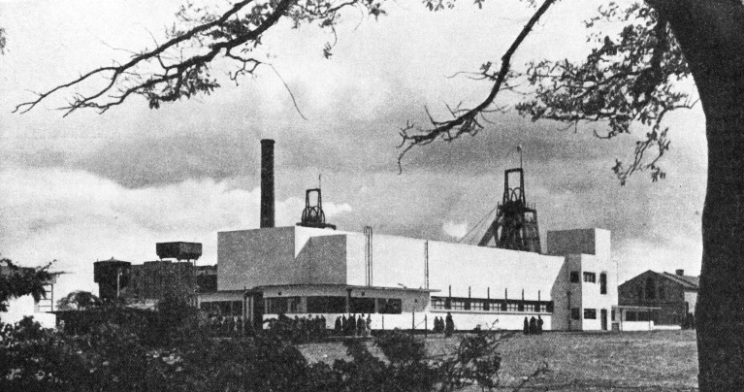 AT THE PITHEAD of Coventry Colliery, Warwickshire, a fine modern building houses the baths which are a feature of the improved conditions of an up-to-date coal mine. The pithead baths at Coventry Colliery accommodate 1,890 men and cost £14,200 to build. Miners coming off duty undress at one side of the baths and put on their ordinary clothes at the other side, so that the dirt of the mine is left completely behind. Every man has two lockers, one for his pit clothes and one for his ordinary clothes. THE mining engineer, the scientist and the inventor are all playing important parts in the quiet but steady transformation that is going on in the coal mines of Great Britain. In the Victorian era thousands of young children went down the mines every day to work long hours tending the pit ponies. In many mines the boys were driven, as if they were beasts of burden, to hauling the tubs. The conditions were such that no one of any sensibility would attempt to defend them. Since those days every attempt has been made to ameliorate the conditions underground and to make the work of the miner safer. Acts have been passed imposing rigid regulations in all mines and inspectors are appointed to see that the regulations are carried out. A fine example of a modern mine is the Yorkshire Main Colliery on the outskirts of Doncaster. Those who began this mine knew that one of the finest seams of coal, known as the Barnsley seam, lay under the surface. As all the pits in the neighbouring areas were cutting this coal, it was considered unnecessary to bore; so shafts were sunk straight away. Unfortunately a bad spot was selected. At some time the crust of the earth in shrinking and folding had broken the Barnsley seam in several places, causing what are known to mining engineers and geologists as faults. The seam did not continue in one unbroken bed. It ceased suddenly at one level and had to be searched for either above or below. These difficulties, however, were overcome and the mine was developed into one of the finest pits in the country. Here, as in most up-to-date mines, the miners use electric lamps. The lamp room is equipped with banks of racks holding thousands of lamps, which are recharged between shifts. The recharged lamps are placed alight in the racks just before a new shift is due. They hang there with their myriad eyes glowing until the miners take them off the hooks before dropping below in the double-decked cages which make the descent of 2,850 feet from surface to mine in about forty seconds. Ventilation is one of the vital problems of the mining engineer; it must be most carefully planned, for upon efficient ventilation depends the safety of the pit and of all working in it. So long as the air is kept flowing strongly on its proper course through the pit, the gases cannot collect, for they are carried along by the air current to the surface, where they can do no harm. If the circulation of the air is stopped the gases gather in depressions and odd corners of the workings and become a source of danger. The air flow is controlled by the doors, which are made in pairs. When the first door is opened, the next door a few feet away prevents the normal circulation of the air from being disturbed or broken. The space between the doors is really an air-lock. When the second door is opened, the first door, which has already closed under the pressure, prevents the air from breaking through and leaving its proper course. The bottom of the shaft of a mine resembles a railway junction with roads converging on it. Electric lamps illuminate the scene and give ample light for the men to see. There are long lines of tubs, some laden with coal moving regularly towards the shaft, others empty and moving away back to the coal face. At the vantage points stand men who control the trains. With a swift movement of a rod, they detach three tubs from the train and send them sliding to the cage, halting the train behind with another swift movement of the rod upon a lever at the foot of the foremost tub. In a workshop halt a mile below the surface two men may perhaps be seeking to restore the form of an arch-shaped girder in a powerful press. Piled up on one side may be heaps of girders that were once true arches, some only slightly out of the true, others all twisted and distorted in the queerest way imaginable. They indicate the immense pressure of the overlying earth. In some collieries the pressure on the ends of the props may amount to many tons to the square inch, and the mine manager can keep the roads open only by vigilance. Various methods have been adopted to enable the steel arches of a new road to accommodate themselves to the settlement which takes place in the roof. In some instances the feet of the arches are attached to short lengths of timber down which the pressure slowly forces the ends of the arches until the roof beds home. Other roads are made in the form of an ellipse, with a steel arch over the road, whose ends run into the ends of an inverted arch that continues under the bed of the road. The pressure from above will force the arches closer together, but there are mine experts who say that roads fitted in this way give no trouble once the arches have been installed, and that the additional expense is worth while because the road traffic is never stopped. The miners of the Yorkshire Main Colliery take the train to their work every day in the same way as the men who go to the city. The miners’ trams, it is true, are not upholstered luxuriously. They rather resemble the cars used on a switchback, each car having twelve wooden seats to hold twenty-four men. The movable iron back rests resemble those fitted in tramcars. When the men have finished work at the coal face, they collect their Dudleys, or water bottles, put on a vest and jacket and go crowding to the train. The 10-feet road to the coal face bears a stronger resemblance to a tube tunnel than to a road through a coal mine. The whole road is arched with girders of steel at such short intervals that as the electric tram travels along at six miles an hour they seem almost to join one another in the same way as the lining of rings in a railway tube. Every 30 feet on one side of the road an emergency hole is cut in which men can shelter if necessary. It takes twenty minutes to carry the miners the two miles to the coal face, and no trace of coal or coal dust is visible the whole way. The road is of a uniform grey colour, quite unlike the average conception of a coal mine. The boots of a man who has walked to and from the coal face look just as though he has been walking along a dusty country road. That is another remarkable thing about this mine - the strong resemblance it bears to a quarry, except at the seam itself. Every night squads of men go through the mine and scatter 150 tons of stone dust as fine as flour over all the roadways to remove the possibility of a coal dust explosion. The dust ensures the safety of the miners and protects the mine from disaster. At the face of the Barnsley seam, which stands up glittering and black just over seven feet high, the miners provide an object lesson in the latest mechanical methods of cutting and conveying coal. There are no men lying on their sides toiling to undercut the seam with picks, then knocking away supporting timber props, waiting for the dust to clear and shovelling the coal into tubs. 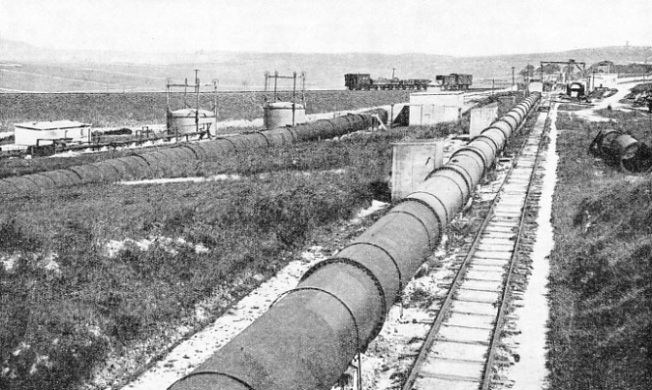 CONTINUOUS LINES OF TUBS, as the small wagons are called, bring coal from the mine to the surface. The full tubs are loaded into cages which bring them to ground level. There they are drawn up to the tippling shaft, where the coal is discharged on to the screens. The empty tubs pass back to the cages and descend into the mine ready for another load. Thousands of tubs are handled in this way every day. To deal with 20,000 tons of coal a week about 60,000 tubs have to be handled. Instead of the ordinary pick, the men use light automatic coal-cutters that resemble the drills of the roadbreakers. The miners handle them easily and with such dexterity that the seam falls before them. The noise made by the cutters underground can be imagined, but any observer of the old method and of the new can see at a glance how much toil and energy the automatic cutter saves the miner. There are several types of coal-cutter which inventors have provided for the mining industry. One type bears a strong resemblance to a circular saw, the disk of which works horizontally instead of vertically, as is. usual in a sawmill. The disk projects from a strong metal frame which carries an electric motor or compressed-air engine for working it, and the cutting chisels are placed at intervals around the edges of the disk. The metal frame is fixed o the floor of the mine parallel with the seam, the circular cutter being placed against the lower edge of the seam. As the cutter revolves it is pressed into the seam, which it undercuts to the full width of the machine. On withdrawal there is left under the coal a clear space of perhaps three inches which allows the seam to be brought down. A type of machine which does similar work differs from the circular cutter in that it is equipped with a chain in which the cutters are set. This chain, which runs round a frame or bar, operates in almost the same way as a bicycle chain would work if the cycle were lying flat on the ground. The automatic cutter used in the Yorkshire Main Collery is similar in appearance to the automatic pick used by the men who break up the concrete foundations of a road. In the same way as the road-breaking machine, the coal-cutter is worked by compressed air, but whereas weight is an advantage to the road-breaker because it helps to drive the chisel into the concrete, it would be a big drawback to the miner. This automatic coal-cutter, therefore, has been made as light as possible to enable the miner to wield it overhead or in any other position without placing an undue strain on his arms. Right along the coal face stretches a conveyer belt which automatically carries away the coal as the miners cut it from the seam. The stream of coal flows on to the belt to the haulage road close by. 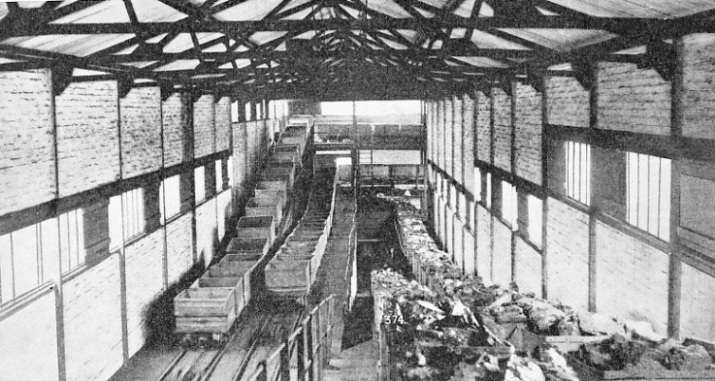 Here the empty tubs are waiting in a long line, and the men at the head of the belt direct the coal down a chute to fill each tub, which is at once clipped to the steel haulage rope and sent on its journey to the shaft. 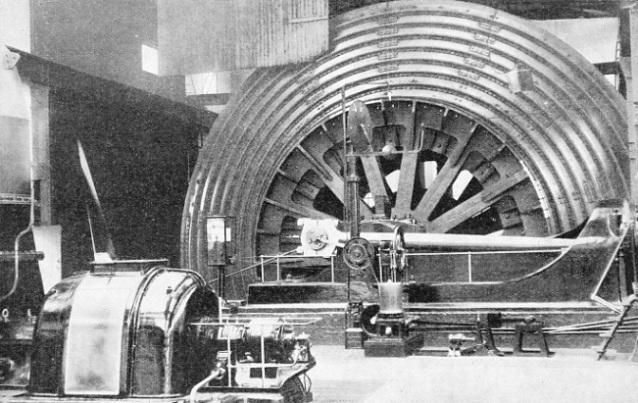 It is an impressive example of modern coal mining in which compressed air, electricity and the latest mechanical inventions play their part, the compressed air being taken to the coal face through main pipes from which the cutters draw their power. A white line is chalked straight as a die along the roof parallel with the seam. A certain distance from this line the miners must set their steel props to hold up the roof, and they measure from this line to see how much coal they have cut. They are paid by the yard, which means that when they have stripped the coal to a depth of one yard they are credited with a certain sum. The rule is that when they have stripped a yard of coal they must stop to build up the stone in the space behind them to help to take the pressure as the roof closes down. Sometimes large holes, known as gobs, are formed, and it is here that gases may collect and cause explosions or fires. After the miners have finished building up, they take out the back line of props and resume the cutting of the coal. The whole of the Barnsley seam is being cut away on what is known as the long wall system of mining, and the earth is slowly settling down and adjusting itself behind the miners as they move forward. Because it gives them a safer roof, they leave a foot or eighteen inches of coal at the top of the seam. Working in a temperature of 80 degrees at the face, the miners do not need to wear many clothes. They toil stripped to the waist, with a pair of scanty shorts over their hips and the usual stout mining boots on their feet. To reach an economic level the output of the pit needs to be in the neighbourhood of 20,000 tons a week. Dealing with this amount of coal, and with the stone and stone dust, makes it necessary to handle and haul about 60,000 tubs, a feat that demands the most efficient combination of men and machines. In moving 10,000 tubs or more a day the saving of seconds becomes important, and the time taken for every ascent and descent of the cages is automatically recorded in red ink on a graph in the winding room. The cages lift 4 tons 16 cwt of coal at a time, which is carried in six tubs, three on each deck. These tubs are unloaded and the empty tubs loaded by the teams at the pithead with a machine-like dexterity. AT THE SURFACE, coal from the mine is graded, cleaned and loaded for dispatch in railway wagons. 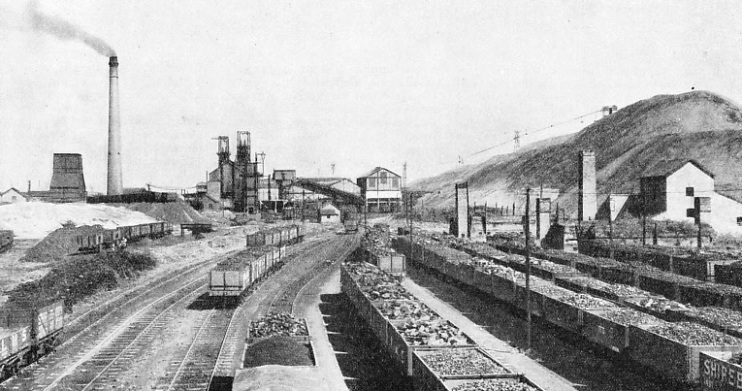 This photograph shows the extensive railway sidings at the Shirebrook Colliery, in Derbyshire. Coal from the mine is cleaned, and shale and stone are taken out. This refuse is loaded into hoppers which discharge it on to the huge dump seen in the background. In this and every other mine the force of gravity is made to do as much work as possible, to save haulage costs. For this reason the engineer in opening up a new mine prefers to place his shafts where they will tap the seams at their lowest point in the area to be worked, so that in cutting the coal there will be an upward slope away from the shaft. The full tubs of coal can then run down to the shaft under their own weight and can be made to haul the empty tubs back to the face. Such an arrangement, if the inclination of the coal seams permitted it, would be ideal. In practice the haulage engines worked by electricity are relied upon to haul through the colliery workings some miles of endless steel ropes to which the tubs are clipped to keep them moving between the shaft and the coal face. To cope with the traffic underground in the Yorkshire Main Colliery there are seven electrical haulage engines. One of 100 horse-power and one of 150 horsepower do the work of hauling the miners to and from the face. Of the other haulage engines one is of 75 horse-power, two are of 100 horse-power, one of 200 horse-power and one of 300 horse-power. Their task is to keep the steel cables moving round and round the roads in the mine. engines keep the fans turning to ventilate the mine. There are fourteen boilers to raise steam for various purposes, and the electrical power plant consists of two turbo-alternators, generating current at 3,300 volts. The mine demands still more power; so a 10,000-volts cable has been brought in from outside, and there are all the necessary transformers for stepping up and stepping down the voltage. For the haulage machinery the pressure is stepped down from 3,300 volts to 440 volts, and for lighting it is stepped down from 440 volts to 220 volts and 110 volts. If the current should fail, the lighting system can be carried on from the accumulators until things are put right. The two pumps can raise 48,000 gallons an hour from the supply well, which is 370 feet deep. There are cooling towers for reducing the temperature of the water - in fact, all the mechanical and scientific adjuncts of the new age are used in the colliery. An impressive thing in the engine house is the huge drum over which the steel cable carrying one pair of cages is wound. This monster would dwarf the average suburban house, for it stands 34 feet high. It can land the cages quite gently at the top or bottom. The rate of the cage’s travel varies, yet the pace at which the drum revolves remains constant, except just at the start and finish of the wind. The drum is made of a double conical form, and as at the start of a lift the rope for the ascending cage is on the small part of the’ cone its upward motion is therefore slower and the mass of the cage and the rope are more easily set in motion. The rope of the descending cage is on the large part of the cone, but gravity aids its start. This arrangement balances the load on the engine. As the tubs of coal emerge from the shafts, they are sent sliding down to the weighing machines. Thence a roller chain resembling a gigantic cycle chain catches in the hooks under the tubs and drags them up to the tippling shaft, where the coals are shot on to the shaking screens, to get rid of the small stuff, before they flow in an .endless stream along the picking belts. Here keen-eyed men stand removing any stone and dirt from the coal as it moves past, and the piece of shale that slides past one man whose hands are engaged in picking out other pieces of stone will be seized on by the next man in the line. A s the pickers work, they fling the stone and dirt upon a moving belt which conveys it to the hoppers. Directly a hopper is full of waste, it is sent on its journey along the ropeway to the mountainous dirt dump in the distance. Meanwhile, the coals, which are sorted into three sizes, move steadily to the coal trucks which have been assembled in the big sidings. AT THE COAL FACE at Bromley Pit, Pensford, Somerset. 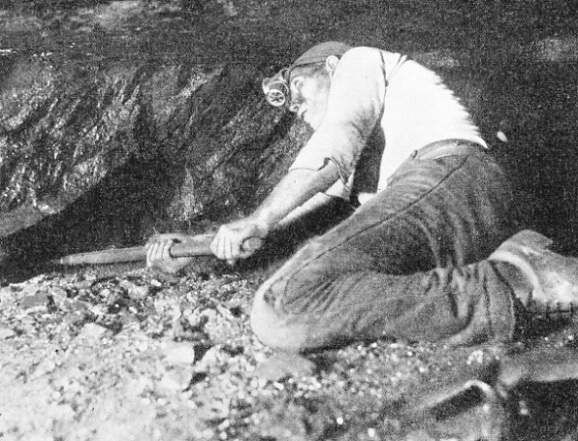 The miner is working on a 2-feet seam with a pick. In the working of larger seams hand labour is being replaced by various types of automatic cutters. The coal and dirt that fall through the 3-in screen are carried to a big bunker. From this bunker they are lifted to the washing machine, which can deal with 160 tons an hour. The coal, being lighter than the stone and dirt, is separated out by the flowing water; the heavier waste gravitates to the bottom, where it can be dealt with. The washed coals are screened into four different sizes. The largest size of coal will pass through the 3-in screen, but not the 2-in screen. Of what passes the 2-in screen some is stopped by the 1-in and smaller pieces by the ½-in screen. A recent invention in coal preparation is a machine which automatically picks out any stone from a moving stream of coal. Electric fingers touch each piece as it passes along and separate stone from coal with uncanny accuracy. At a change of shifts, hundreds of men with clean faces and dirty shorts pass into the lamp room for their lamps and then stream away to the cages in which forty-eight of them pack at a time to be dropped down to work, while the rising cages disgorge the miners with dirty faces as well as dirty clothes. A few steps bring the relieved miners to the pithead baths, inside which are the electric boot brushers. Another step or two brings them to the banks of lockers for storing their pit clothes. Every man has two metal lockers, one for his pit clothes and one for his outdoor clothes. On the side of the baths where the miners take off their pit clothes, the floor may be seen covered with fine coal dust that has fallen out of their clothing as they have undressed. On the other side of the baths where the miners dress no trace of coal dust is visible on the floor. As soon as the baths have been cleared and cleaned after a shift, the fans are turned on to blow warm air through all the lockers. They are all connected up with a central air duct, and the warm air is blown through the lockers until the clothes of the miners are thoroughly dried in readiness for the next shift. The pithead baths are working a revolution in the homes of the miners wherever they are installed. They are a boon to the miners and a blessing to their wives. The sinking and developing of a coal mine to-day calls for vast financial resources to cope with unexpected difficulties that may be met with underground. The mass of information that has accumulated concerning the coalfields of Great Britain, and the geological maps that have been produced, enable the geologists and mining engineers to trace various well-known seams for long distances. The type of coal from various boreholes or mines can be identified as having come from certain seams. By a close study of the configuration of the country and of the depth from which the samples have been taken, the experts may be able to indicate the approximate run of the seams, whether they rise or fall, whether they tilt this way or that. But all information is necessarily based on the points at which the seams have been tapped, and it is impossible to tell with certainty what tricks Nature has played in the surrounding areas or what difficulties she may have saved up for the mining engineer. The Coal Mines Act insists that every mine must have two shafts connected underground by a tunnel of certain dimensions. In the event of one shaft being thrown out of use, the other will be available for ingress or egress - an excellent safeguard for the workers underground. The sinking of the Tilmanstone shaft in Kent provides an example of the difficulties that beset the mining engineer. Water is one of the problems of the mining man. Although a certain amount of water is necessary in running a mine, water may create overwhelming trouble if met with in sinking the shaft. UNDERGROUND ELECTRIC RAILWAYS are used extensively in coal mines. 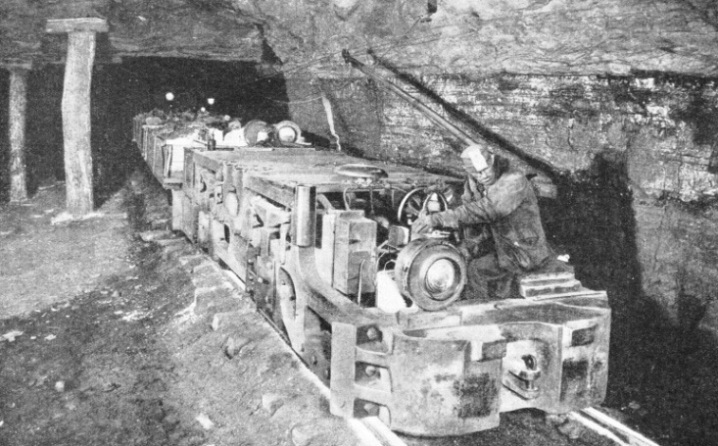 Above is shown a train of this type, with overhead conductors, in a mine in Virginia, U.S.A. Similar types of locomotive haul the tubs from the coal face to the cages which bring them to the surface. The men who started the Tilmanstone shaft were assured that there was no danger of penetrating a water-bearing stratum on the site selected. They began to drill into the earth, removing the debris and lining the shaft with brick as they went. One day a man felt his drill begin to shiver in the hole. A few seconds later it pushed through a soft place and water and sand shot up into his face. Before the men in the shaft could realize what had happened the water was swirling all round them and they had to fight to get out. They found it impossible to cope with the flood, so the work came to a standstill. More money was raised to enable the shafts to be pumped out, and the work of sinking was resumed. The engineers had so much trouble with one shaft that it looked as though they might be beaten. The sides were so soft and kept caving in to such an extent that it was impossible to brick them. Then one of the engineers decided to pour cement down the shaft to see if it would consolidate the sides sufficiently to allow them to be lined with brick. Luckily his idea was sound and the men were able to continue the work. It took them six years to sink the twin shafts to the Beresford seam, which was reached at a depth of 1,500 feet in 1913. The coal of this seam is so friable that it can be broken out with the naked hand, but it is eminently suitable for certain purposes. As this pit has a rock roof, it is worked on the pillar and stall system, which leaves pillars of coal standing so that they support the overlying rock. The engineers dealt with the water by building one pump house at a depth of 600 feet at the side of the shaft, another at 1,100 feet and one at the bottom. By means of these sets of electrical pumps the water, which runs in a continuous stream night and day in the drain by the side of the main road until it reaches the shaft, is conveyed to the surface. For every ton of coal taken out of the pit, the pumps take out twenty tons of water and the air fans deliver eight tons of air to ventilate the mine. At first, the mine had only a single line linking it with the railway. Eventually, after having spent £15,000 in legal costs, the owners obtained permission from the Railway and Canals Commission to build a ropeway nine miles long, by which the buckets of coal could be sent directly over the fields to Dover Harbour. That ropeway, which cost £130,000, took a year to build. The Tilmanstone pit can now load ships directly from its great bunkers on the wharf. The buckets of coal, when they arrive at the harbour, shoot their contents automatically into the high metal bunkers, and from the bunkers the coal can be loaded into the holds by the operation of levers which allow the coal to pour down metal chutes. The original boilers for raising steam at Tilmanstone were stoked by hand, but in 1929 a pulverized fuel plant was installed. The small coal pours from the bunkers over magnets which extract any particles of metal from it; then the manganese steel pulverizers crush the coal into the finest dust. This dust is sucked up a pipe and mixed with air before being blown into the top of the furnace. It blazes out as an intense flame, so hot that the original furnace lining, which had been expected to last for three years, was melted away in three months. The engineers thereupon fitted a new lining which was able to resist the heat, and at the same time they put in a water-cooled hearth for solidifying the slag. Some of the water which gave so much trouble when the original shaft was being sunk has thus been turned to good account. It now helps to run the turbines and provide the mine with all the electrical power that it needs. COAL-DUST EXPLOSION GALLERIES at the experimental station near Buxton, Derbyshire. The station is operated by scientists under the direction of the Safety in Mines Research Board. In the galleries at this station the effects of coal-dust explosions are carefully recorded and researches are made which will help to prevent similar explosions in coal mines. To the coal miners of Great Britain the creation of the Miners’ Welfare Fund was the dawn of a new age. A halfpenny a ton on all coal raised is set aside for the fund, and this small levy amounts to a huge sum in the year. For instance, in 1935 the amount of coal produced totalled 222,000,000 tons, which benefited the Welfare Fund to the extent of £462,500. As well as adding to the comfort and amenities of the miners, the administrators of the fund seek to make conditions safer underground. Dozens of intricate scientific problems are being quietly but steadily investigated by a group of scientists who work under the direction of the Safety in Mines Research Board. Already a method has been found of enclosing electric switches in casings with a series of small holes that enable the switch to function normally and allow any gas from inside the switch to escape, at the same time preventing any flame from inside the switch-box from getting through to the outer atmosphere and causing an explosion. Other experiments have revealed that Norwegian timber is slightly stronger than English, and that props saturated with water will break under half the load they can support when dry—a matter of great importance to wet mines. caused upon firing a cartridge. In the course of these researches the experts have succeeded in taking some unique photographs of explosions by firing a gun in a special chamber. A beam of light from an arc lamp has been directed through an aperture, across the path of the explosion and upon a steel mirror. This mirror has reflected the image caused by the explosion into a camera, the shutter of which was operated by electrical contacts. By attaching their film to a drum which revolves 4,000 times a second, the specialists have obtained high-speed photographs having the rapid exposure of one-thousandth of a second. Some of their fastest and most extraordinary photographs of explosions were taken in a millionth of a second by the use of a spark from a Leyden jar. The strange thing is that, instead of using the fastest plates or films obtainable for this ultra-rapid work, the experts have always used the slowest. At such high speeds the difference between the slowest and fastest emulsions is so trifling as to be of no account when compared with the importance of obtaining the finest possible definition in the photograph, so that the specialists may study and understand exactly what happens when an explosion takes place. An explosion pushes before it a body of air which is termed the shock wave. This is followed by the pressure wave and other gaseous waves, with the flame coming after. Through their experiments the scientists realized that if they could impose a blanket of something that was non-explosive between the dangerous flame given off by the explosion and the gases in a pit, they could produce a safe explosive for use in mines. They solved what appeared to be an insoluble problem in one of the simplest ways imaginable. They surrounded a cartridge with a jacket or sheath of bicarbonate of soda, so that when the cartridge exploded, the air round the flame Was charged with an inert or non-explosive gas which formed, a safety blanket between the flame and any explosive gases near by. Another important discovery derived from the researches of the past few years is that if stone dust be mixed with coal dust, the coal dust becomes non-explosive. Thus stone dusting, as it is termed, or keeping down the dust by spraying with water or some fluid, has been made compulsory in mines. THE GREAT WINDING DRUM which carries the steel cable that raises and lowers a pair of cages in the shaft of a coal mine. The conical form of the drum helps to balance the load on the engine, for the weight to be handled varies with the changing length of the rope as the cages move up and down. You can read more on “Battersea Power Station”, “Handling 2,000,000 Tons of Coal” and “How Gold is Mined” on this website. 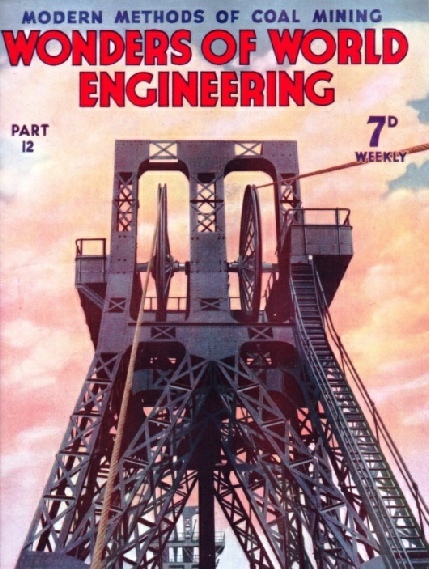 The cover of part 12 shows the pithead of the Horden Mine, one of the many pits in the county of Durham.